The holiday season is quickly approaching so it’s time to start doing more sales and deals posts here on The eBook Reader Blog to keep you updated on the latest deals for ebook readers and tablets, as well as related items like covers and such. So let’s get started. 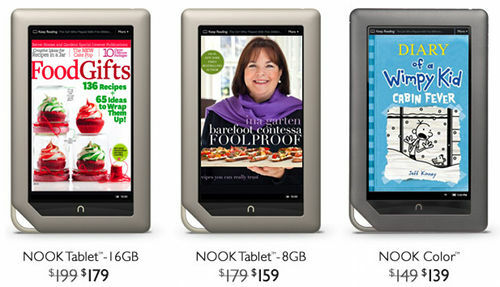 This past week Barnes and Noble dropped the price of the Nook Color to $139 and the 8GB Nook Tablet to $159 (16GB is $179). But it gets better. The refurbished 8GB Nook Tablet is $129 and the Nook Color is $99, and on eBay through B&N the 16GB Nook Tablet is $139. And Micro Center has new Nook Colors for $109. B&N has the refurbished Nook Touch for $74 on eBay. But we can do better than that. A new Nook Touch can be had from Micro Center for $69 and Office Depot for $75. Micro Center also has certified pre-owned Nook Touches for $49. The Kindle Paperwhite is currently on backorder until the week of December 17th, so its Christmas run is almost at an end already. The Kindle Touch is no longer being sold anymore by Amazon, with one exception. They’ve still got the refurbished 3G Kindle Touch for $129. It’s a good alternative for those that want an E Ink Kindle with audio support and text-to-speech since neither of the newer models have that. Sometimes older Kindle models can be found on sale from various 3rd party retailers. Micro Center has the Kindle 3 Wi-Fi for $99 with ads and $109 without. Amazon only sells the 3G model now and it’s $139. These models have the physical keyboard and audio support and text-to-speech. Right now on Amazon CaseCrown covers for all the various Kindle Fire models are selling for cheap. I picked up the blue Ridgeway cover last week for the Kindle Fire HD for $13.19. It’s a good cover for the price. I’ll post a review later this week. $114 Sony PRS-T2 (white) open box at Newegg. $69 Sony PRS-T1 (in store only) at Fry’s. $39 Sony PRS-350 (in store only) at Fry’s. $69 Kobo Touch refurbished at Best Buy. $79 Kobo Touch (in store only) at Fry’s. $79 Ematic EGLXL102B 10-inch Android 4.0 tablet at WalMart – This is by far the cheapest 10″ Android 4.0 tablet I’ve seen. Not good, mind you. Just cheap. $59 Ematic Genesis 7-inch Android 4.0 tablet at WalMart – Another really cheap tablet with ICS for those on a budget. $299 Asus Eee Pad Slider 10-inch Android 4.0 tablet with keyboard at eBay. $249 Asus Transformer TF101 10-inch Android 4.0 tablet with 32GB at Newegg (refurbished). $199 Samsung Galaxy Tab 2 7-inch Android 4.0 tablet at Newegg. This doesn’t have a high res screen but is otherwise a solid tablet. $159 Blackberry Playbook 16GB 7-inch tablet at Office Depot. $359 iPad 2 16GB at Micro Center. $469 iPad 3 32GB refurbished on eBay. $219 Lenovo IdeaTab S2109 9.7-inch Android 4.0 tablet with 16GB at Office Depot. Wow, $39/$69 for the PRS-350/T1 is a steal. Pretty much my favorite basic readers by far. Honestly, I might never have seen the need to upgrade except for the lack of frontlights. Just don’t even install Sony’s crap softwar, just use Calibre instead. It’s still nice after 2 years too. I was using it the other day to compare to the Kobo Mini. The only thing it really needs is some more font sizes and types, but that’s easily fixable with Calibre at least. Yeah adding fonts to the PRS-350 and 950 is quite easy. There are clear instructions online and copy/paste-ready CSS commands. I added Georgia to all of my eBooks. That stock PRS-350 font is too thin and jagged. Too bad B&N is not (supposedly) going to update the Nook Tablet software to the same as the new HD. I would absolutely buy it if they were.